A frosty start to Subaru Rally Tasmania proved an All-Wheel Drive advantage for the Subaru do Motorsport team today. Molly Taylor and co-driver Malcolm Read, used the sure-footed performance of their Les Walkden Rallying-prepared WRX STI to their benefit, taking second place, as some other high-profile competitors suffered difficulties on Heat 1 of the Launceston-based event. It was the Subaru do team’s best performance so far this year. In the fourth round of the 2018 CAMS Australian Rally Championship – the first time an ARC event has been run on the Apple Isle in 10 years – the action began last night before a crowd estimated at 5,000, who braved the chill at Inveresk, just a short distance from the city centre. 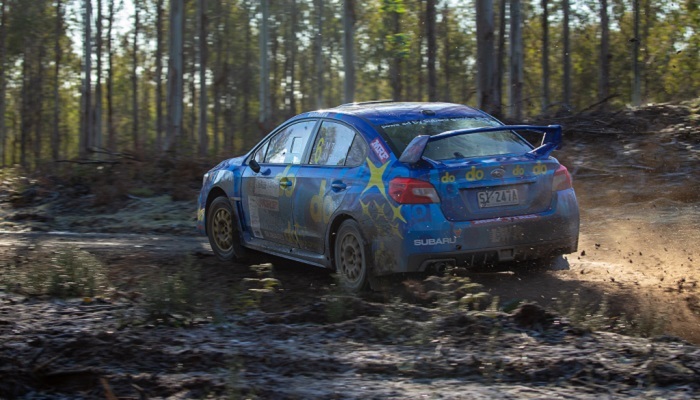 With an SS1 distance of just 0.82 of a kilometre, the Subaru do duo’s sixth place proved immaterial when action resumed this morning in the chilly hills north east of Launceston. Championship leader Eli Evans distinguishing himself with wins on each of the morning’s five stages, but Taylor’s laser-focus was on elevating her current fourth-place standing in the series. It proved a wise approach, as Subaru do seized third place on SS2, while mechanical gremlins were costly for another championship candidate, Harry Bates, in the Toyota Yaris AP4. Third for Taylor and Read on SS3 promoted the pair to second overall, where they remained over the following three stages going into midday service. Another high-profile contender, Steve Glenney – currently second in the championship in his WRX STI – suffered a significant “off” on SS3, with substantial front-end damage denting his prospects, though a big effort by his service crew saw him restart this afternoon. The final five stages maintained Subaru do’s overall second in Heat 1, with the repeat of the day’s longest stage, SS11 Lisle 2, proving perhaps the most challenging, having cut-up significantly after being pummelled by the 35 entrants, as it defrosted into something of a mud bath in places. Overall, the heat was one of the most challenging of the 2018 season, in both duration and the number of stages. Molly said: “We had very challenging grip levels this morning in the frost. “We’d get a nice rhythm going, then suddenly turn onto sections that were really muddy, which meant we were double-checking braking, because it was so tricky. “We were constantly having to speed up, then suddenly slow and also take a racing line onto gravel, but given the challenges, it’s great to be where we are at the mid-point of the rally. Sunday’s Heat 2 covers six more stages including the longest of the rally, the 24.99 km Lonestar Ridge 1 and 2. Total heat distance is 112.26 km, with action due to conclude late tomorrow afternoon. Subaru do Motorsport merchandise is on sale this weekend at the Inveresk Service Park. Among the new items is a polar fleece and beanie. The merchandise can also be obtained at: https://shop.subaru.com.au/or via authorised Subaru retailers.